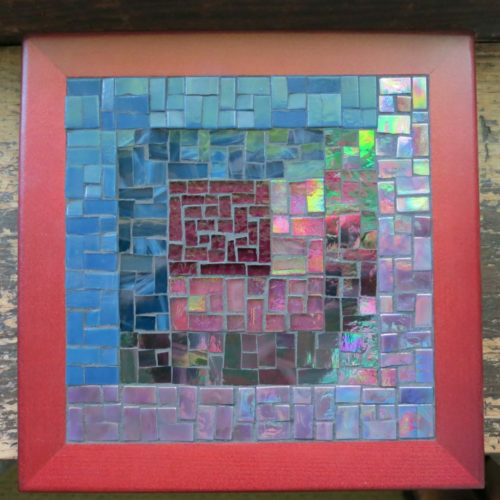 Eggplant and Navy Log Cabin Quilt Trivet by Margaret Almon, glass on wood, 8×8 inches, $76. SOLD. This is the second of a trio of Asymmetric Log Cabin Quilt Block Trivets. The first two were wedding gifts from a sister to siblings, and the last was turnabout Gifting the Gifter from one of the recipients. Shades of eggplant purple and navy blue were some of the most challenging to find. These colors tend to either look black or have too much pastel tint. Some colors are elusive. Here’s another I made with some of the same tones. 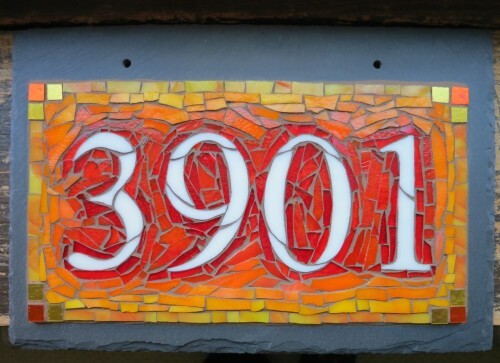 Orange Ombre House Number 3901 by Nutmeg Designs, 4 Digits on 12×8 inch slate, $225. 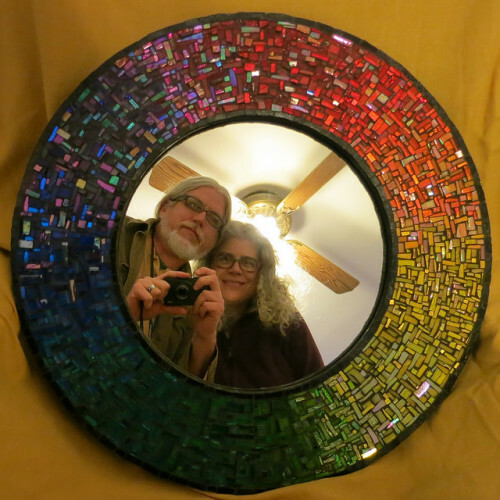 Wayne Stratz and Margaret Almon. 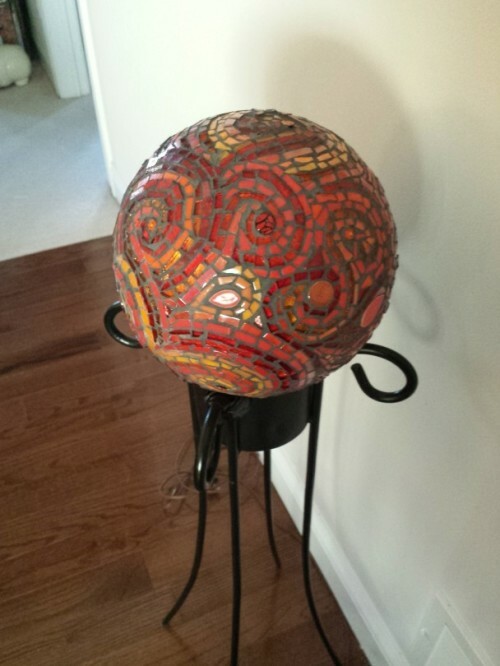 Orange and Red Paisley Gazing Ball by Margaret Almon. This was a bowling ball that belonged to the client’s father. Glass on standard bowling ball, $675, SOLD. Leap and the Net Will Appear by Wayne Stratz. 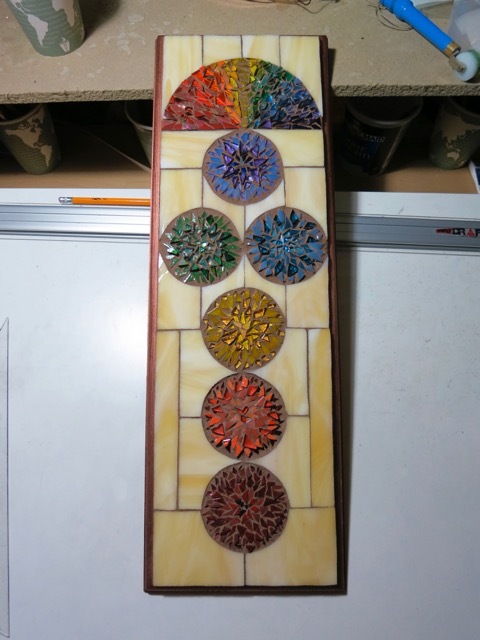 Stained glass and scrabble tiles(not pictured), 11×14 inches. She arrived with print-outs from our website, and a bag of Scrabble tiles. 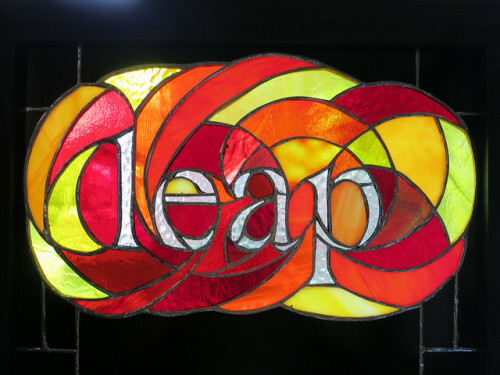 She wanted the word “leap” in flowing bright colors: red, orange, yellow, and the tiles spelling out “and the net will appear.” She wanted the light to shine through all that color, so the project went to Stratoz. We’ve known this client for a long time, along her path to becoming a minister, with all manner of hurdles, and yet discerning her call, attending Community College, Seminary classes, finding a church and her ordination. 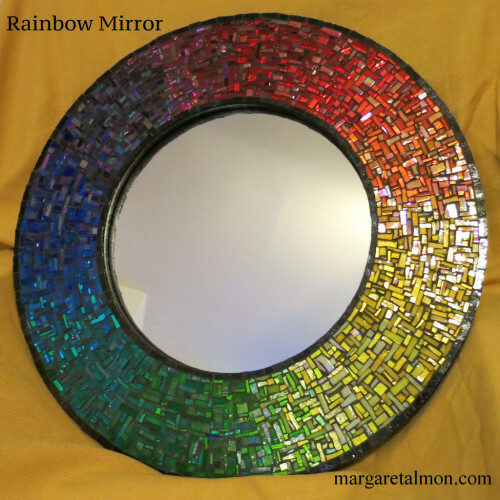 It was an honor to know she looked at our work when she needed an infusion of inspiration and joy and that she chose to commission original art as her birthday gift ~ rather than, as she put it, getting another piece of jewelry that she never wears. What word speaks to you? Talk to us about commissions. 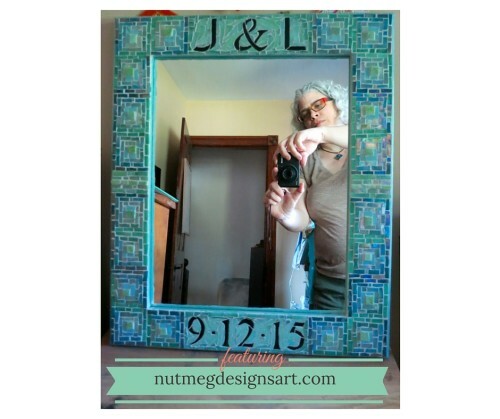 Blue Green Log Cabin Quilt Wedding Mirror by Margaret Almon of Nutmeg Designs, $441, SOLD. Red Tail Hawk Feather Mosaic Panel by Nutmeg Designs. 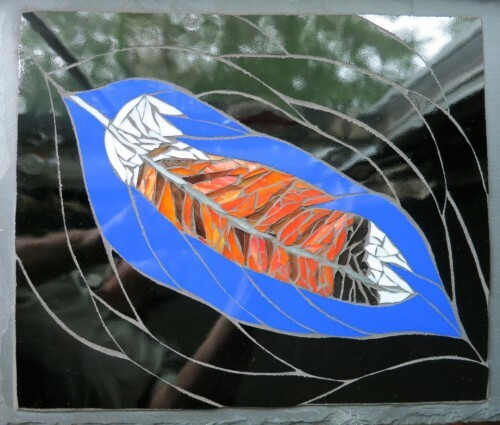 Background design by Wayne Stratz, feather patterning by Margaret Almon, glass on slate, 11×14 inches, $187, SOLD. Listening by Nutmeg Designs. Glass on slate, 6×15 inches. Listening was my natural state as a child. Listening to the adults tell stories to me, or talk to each other above me. I became a writer with my storehouse of listening. Stratoz and I had a Christmas commission to create a sign with the word Listening for a spiritual director. Listening had become a gift of her vocation, when her natural state was talking. I was introduced to spiritual direction at the University of Scranton in the early 1990s, where I had my first librarian job. The University had a contemplative spirituality program, and I started seeing an Ignatian nun(as she called herself) once a week. She asked me about my experiences that week, and asked me where I found God in this. Then she would listen. It was as if she was handling a treasure, gently holding it in her hands. Winding my way around the letters of listening many years later, I am grateful for the listeners in my life who encouraged me, recognized me, loved me, and my desire is to stay true to my listening nature, and in turn encourage, recognize, and love. I spend time immersed in numbers, in their shapes, and how straight and curved connect with each other. Each house number takes on its own personality, as I wend my way around them. This 340 reminded me that I also spend this time immersed in color, contrast, line, all elements of composition. Learning about composition was exciting, a new language. 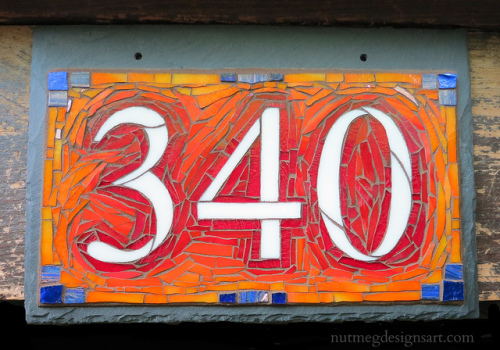 The people who commission house numbers from Nutmeg Designs understand this language, whether explicitly or implicitly. Abstract art allows composition to speak freely, and it is a joy to spend time with each number imagining what will make it glow or pop or infuse a house with color.